Learn how to access the 80% of patients looking for Mercury Safe and Mercury Free dentists on the Internet. Establishing a Prominent Internet Presence is the key to adding new patients and incresing revenues. To learn more about the many benefits of membership in the # 1 Mercury Safe Dentist Internet Listing Service . . .
• Mercury Free & Mercury Safe: What's in a Name? Mercury Free Dentist, Holistic Dentists, Mercury Safe Dentist... and More! 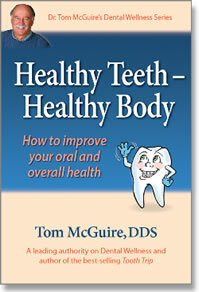 • Mercury Free & Mercury Safe Dentists in your area: Click Here to Find One! If you aren't sure, and want it to be, then New Directions Dentistry's DVD on How to Minimize Occupational Exposure to Mercury in the Dental Office and Make Your Practice Mercury Safe. The DVD will teach you how you can protect yourself, your patients, your staff and the environment from excessive and unnecessary exposure to mercury. It will also show you how to generate new patients, increase revenues and prevent potential lawsuits. Six hours of Continuing Education (CE) Credits are available. 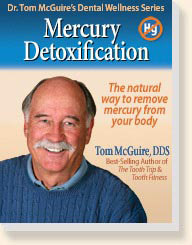 Tom McGuire, DDS is a leading authority on mercury detoxification, chronic mercury poisoning & preventive dentistry. He is the author of the best selling books: The Poison in Your Teeth; Mercury Detoxification, Healthy Teeth, and The Tooth Trip. Dr. Tom is available for phone consultations regarding mercury amalgam fillings, mercury detoxification, and gum disease prevention. Want to add an associate to your practice? Want to sell your Mercury Safe practice? Want to communicate with other Mercury Safe dentists? Learn how mercury vapor released from amalgam fillings can devastate your immune system and cause, contribute to, or make worse every health issue you have . . . . Important information on how chronic mercury poisoning, gum disease, and other oral health issues affects overall health. Unless you understand how oral health can devastate overall health you will never get the treatment results you seel for your patients. The Poison in Your Teeth proves that mercury is continuously released from amalgam (silver) fillings and is hazardous to your health. Mercury is the most poisonous, naturally occurring, non-radioactive substance on earth. It contributes to over 100 health issues, including heart disease, autism, chronic fatigue, MS, allergies, depression, memory loss and anxiety. The Poison in Your Teeth is vital for women who are planning to have a family and are unsure or skeptical about how these fillings affect them, the fetus, nursing baby and child. 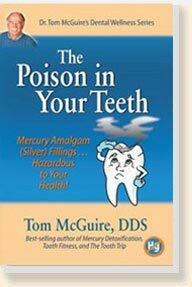 Dr. McGuire’s book is a must read for dentists, health professionals, and anyone who wants to have these fillings safely removed, detoxify mercury from the body, and improve their overall health. • To heal the damage chronic mercury poisoning has done to your health. Dental disease can no longer be considered a minor problem with the gums and teeth. It is a disease of the body and can contribute to many serious health issues, including heart disease!